There are lots of bugs here in South Carolina, and they’re all capable of showing up in your home. But while termites, mosquitoes, and ants can definitely be a pain, there’s nothing quite as awful as dealing with a kitchen full of roaches. Simply put: roach infestations are the worst. Fortunately, eliminating the problem is as simple as knowing how to get rid of roaches. With the right approach to roach control, you can say goodbye to your roach problem once and for all. Keep reading to learn more. First off, you have to identify the problem itself. Are you dealing with roaches? You know that much already. But do you know what kind? Here in South Carolina, there are a number of roach species that you might encounter. Generally speaking, though, you’ll run across the American cockroach (A.K.A. palmetto bugs) and German cockroach more often than any other species. German cockroaches are quite small, measuring around half an inch in length, while palmetto bugs can measure up to three inches long. One of the most important steps to take once you’ve noticed roaches is to clean up your home as thoroughly as possible. Roaches need food to survive, and eliminating potential food sources for roaches will make your home a less attractive spot for them to inhabit. This means ensuring that all food is in airtight containers, and that crumbs, liquids, and other food residues aren’t present on your kitchen counters or floors. Figuring out how to get rid of roaches isn’t just a question of cleaning up your home, though. You also have to eliminate hiding spots and seal up entry points around your home. To begin with, go through your home and remove as much clutter as possible. This includes old cardboard boxes, stacks of newspaper, and so on. Then, do the same thing around the outside of your home. Any trash or other debris in the immediate vicinity should be cleaned up and removed. Next, you’ll want to seal up potential roach entry points. In order to do so effectively, you’ll need to be very thorough. Remember that roaches can fit through even the smallest of cracks, which means you’ll have to go over the exterior of your home with a fine-toothed comb. Use caulk or clear silicone sealant to fill gaps and cracks around windows, pipes, and other openings. Once you’ve cleaned up both in and around your home, removed potential hiding spots, and sealed all points of entry, it’s time to treat the actual infestation itself. Unlike some other pests, roaches can be incredibly difficult to eliminate without the help of a professional. Getting rid of a severe roach infestation requires expert-level knowledge and experience. Once you have successfully rid your home of roaches, you’ll want to take the necessary steps to prevent them from returning. This means keeping your home clean, ensuring that entry points remain sealed, and acting quickly if you see signs of roaches in the future. 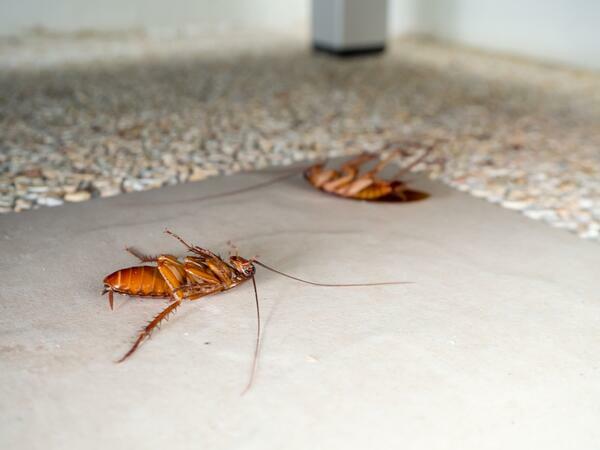 If you’re wondering how to get rid of roaches for good, the bottom line is simple: contact a roach control professional like Home Pest Control. Our knowledgeable team of pest control experts can tackle any pest problem, and our Home Shield Pest Prevention program will ensure that you never have to deal with bugs again. Contact us today to get rid of roaches once and for all!